Like any other high-profile (or even mid-profile) game these days, Assassin's Creed 2 will be available in a collector's edition. Let's take a look at what's inside. Called the "Black Edition", the limited edition box set will ship in "black packaging", and come with a "unique authentic holographic signature". Whatever that means. 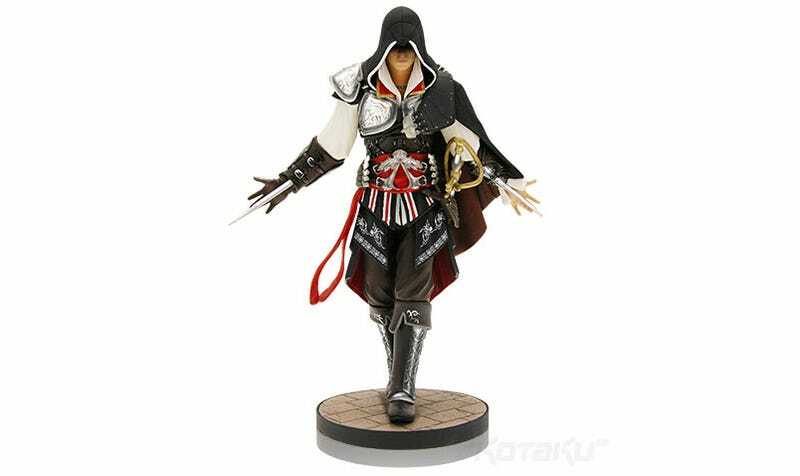 Included will be a "64-page finely crafted leather style hardcover and parchment-finish" book, which has stuff like concept art and developer interviews, a copy of the game's soundtrack, an Ezio action figure (pictured), some "behind-the-scene interviews" and 3 "in-game bonus quests". As far as price goes, currently it's only being listed in PAL territories, at £69.99 in the UK (USD$115) and AUD$149.95 (USD$121) in Australia. Since most games cost around AUD$100 here, you can probably expect the US version to come in at around $80-90.